Scientists ponder the question, "What advances in power technology are required to send human and robotic explorers throughout the solar system?" September 3, 2002: Beyond all the planets in our solar system in a cold, dark, empty region of space, Voyager 1 continues its 25-year journey of exploration. It's headed for the heliopause, that boundary where the Sun's influence ends and the dark recesses of interstellar space begin. From where Voyager sits, the Sun is merely the brightest star in the sky--seven thousand times dimmer than we see it from Earth. Right: In 1980, Voyager 1 visited Saturn--its last stop before exiting the solar system. Image credit: DOE. Voyager doesn't have any solar panels; they wouldn't do any good so far from the Sun. 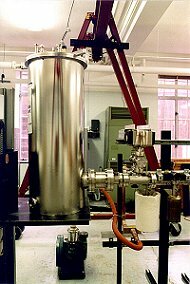 The probe stays in touch by carrying its own power source, an early radioisotope thermoelectric generator (RTG), which converts the heat generated from the natural decay of its radioactive fuel into electricity. Its RTG will supply Voyager with electricity at least until 2020. Space probes that travel much beyond Mars need more power than solar cells can provide. Another example is the Ulysses spacecraft. It was launched in October 1990 from the space shuttle on a mission to study the Sun's poles. To get above the Sun, Ulysses had to fly around Jupiter and slingshot out of the plane of the planets. Near Jupiter, the Sun's rays are 25 times weaker than near Earth. Solar panels large enough to catch this weak energy would have weighed 1,200 pounds, doubling the weight of the spacecraft and making it too heavy for booster rockets from the shuttle. Instead, Ulysses was equipped with an RTG weighing only 124 pounds. It easily powers all the probe's onboard systems, including navigation, communication and scientific instruments. A probe like Ulysses needs a couple hundred watts of power to operate onboard systems. For comparison, the shuttle's onboard systems use 5 to 10 kilowatts (kW) of power, 50 times that. The International Space Station (ISS) uses 10 times more, or about 100 kW for onboard systems. Above: 375 km above Earth's surface, solar arrays power the orbiting International Space Station. The ISS never leaves Earth orbit, which reduces the power it needs. Human missions beyond Earth's neighborhood, however, will require power not only for onboard systems, but also for propulsion and for systems to support humans when they arrive wherever they're going. "To pursue ambitious human missions across the solar system, perhaps returning to the Moon, perhaps going on to Mars, will require hundreds to a thousand kilowatts on the surface and hundreds to thousands of kilowatts for transportation systems," says John Mankins, chief technologist for the Advance Systems Program at NASA headquarters. You can't just plug into the nearest electrical outlet, he added. You have to bring your own power source. Ideally, you'd like to find something that could provide power for both propulsion and operations. Below: Chemical rockets propel the space shuttle away from Earth. Since Robert Goddard's first test launch of a rocket in 1916, space missions have used chemicals to get the acceleration needed to escape Earth's gravity. A rocket's 5- to 15-minute burn sends the spacecraft towards its destination; then it coasts the rest of the way unless it uses the gravity of other planets for an additional boost. 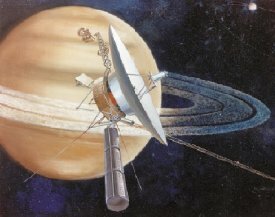 For Voyager, it took years to reach Saturn and then the spacecraft was only able to spend days in the Saturn system and only hours near the planet itself. Mission planners would like to do better in the future. From the perspective of the Exploration Office at the Johnson Space Center, Jeff George sees "an evolving family of related power and propulsion technologies" for the next wave of human exploration. The first likely candidate is electric propulsion (EP). You don't need as much thrust in space as you do to escape Earth's gravity, explains George, but you do need to produce thrust using very little fuel because of weight restrictions. Electric propulsion could provide fuel-efficient thrust after an initial chemical boost into space. Specific impulse--that is, the pounds of thrust produced per pound of propellant used per second--is a measure of the efficiency with which a system uses fuel to produce thrust. Higher is better. 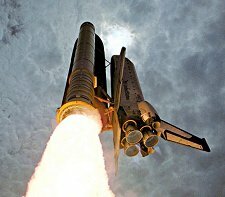 The space shuttle, which stays near Earth, uses chemical propulsion with a specific impulse of 450 seconds or 450 pounds of thrust for a pound of propellant per second. EP has 10 times the specific impulse of chemical propulsion and potentially can go as high as 10,000 seconds. EP got its first try in 1998 on Deep Space 1--a spacecraft that tested many new technologies before it flew by comet Borrelly in 2001. Deep Space 1 needed 2.5 kW to power both its electric ion propulsion drive (pictured left) and other onboard systems. The energy came from an innovative collector consisting of advanced solar cells and a lens to concentrate sunlight on the panels. Together they achieved a 23% efficiency in converting sunlight to electricity compared with 14% efficiency for the solar arrays on the ISS. 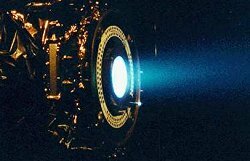 Above: The ghostly blue exhaust of Deep Space 1's ion propulsion engine. Power collected from the craft's solar arrays is used to ionize atoms of xenon. As these ions are expelled by a strong electric field out the back, the spacecraft slowly gains speed. Building on the success of Deep Space 1, a new mission named "Dawn" will leave Earth in 2006. Propelled by an ion engine with a specific impulse of 3100 seconds, Dawn will travel to Ceres and Vesta, two of the biggest asteroids in the solar system. Although Ceres and Vesta lie farther from the Sun than Mars does, the spacecraft will be able to draw all the power it needs from 7.5 kW solar arrays. Manned missions need more power. "The next step for a [human-crewed] Mars mission," says Jeff George, "is to step up to 5-10 megawatts of nuclear power and then scale up the electric thrusters to megawatts per engine." Going from kilowatts to megawatts is not a simple problem. NASA is now working on a 5-10 kW next-generation ion propulsion system. George envisions small, nuclear-electric vehicles of 100-200 kW exploring the outer planets as a pilot version of the megawatt scale they'd like to use for human exploration. Above: Fission, the same atom-splitting process that energizes modern nuclear power plants, is one way to generate high levels of power to propel spaceships. To run a megawatt EP system, you need a source with both high energy and high power. As John Cole, manager of the Revolutionary Propulsion Research Project Office explained, "Energy is the most important factor, but power (the energy released per unit time) determines acceleration." So what source provides enough power? "Nuclear has plenty of energy--and potentially plenty of power, too," Cole observes. "Solar panels provide insufficient power for the entire vehicle to accelerate to levels that permit short trip times." Radioisotope power sources (like the RTGs onboard Voyager) give off a lot of energy over a long period of time, but not a lot of power, only tens to hundreds of watts. To get kilowatts to megawatts of power, you have to go to nuclear fission, says Les Johnson, of NASA's Advanced Space Transportation Program. Right: Radioactive decay, pictured here, is the energy source for RTGs. It's not as potent as nuclear fission. Fission, in which a neutron splits an atom into two radioactive isotopes, is the process nuclear power plants on Earth use to produce electricity. "Bringing along a fission reactor on a spacecraft would be like bringing along your own [mini] power plant," says Johnson. A fission reactor is capable of fueling high-performance electric propulsion beyond the inner solar system. It is longer duration and power rich for performing sophisticated scientific investigations, high-data rate communications, and complex spacecraft operations. That's a pretty good resume for fission, but it still doesn't pass John Cole's test. Cole set himself the requirement of getting humans to the outer planets in a year and back in a year. Nuclear fission has enough energy, but not enough power to provide the acceleration needed. NASA is designing a 300-kW flight configuration system using nuclear fission. But to meet Cole's test, "one needs a very high specific power, power per unit mass vehicle three orders of magnitude better than what we've currently planned for nuclear fission." For that, you have to step up to nuclear fusion--the same process that powers the Sun and stars. Fusion, which releases energy by combining rather than splitting atoms, could in principle supply gigawatts of clean power. However, fusion propulsion systems as we understand them today would be very big, requiring a vehicle the size of the space station or Battlestar Galactica, weighing hundreds of tons--although the size might come down with research. Fusion engines would be very efficient fuel burners with a specific impulse of 100,000 seconds. "Though we couldn't do it in 10 years, if we could launch a fusion propulsion system 10 years from now, we could send a vehicle out to catch Voyager and bring it back," says Cole. That kind of power and speed shortens the time that astronauts would be exposed to harmful cosmic radiation and the bone loss that comes from prolonged weightlessness. Perhaps there's something even better than fusion: A thruster powered by matter-antimatter annihilation would have a specific impulse of 2,000,000 seconds, according to Cole. "Propulsion isn't the only reason to go nuclear," notes Colleen Hartman, director of solar-system exploration at NASA headquarters. "Onboard systems benefit, too. The excess power is like getting the Las Vegas strip instead of a single light bulb. It gives you greater communication and mission flexibility." The Mars Smart Lander and Mobile Laboratory, slated for launch as early as 2009, was originally conceived as a solar-powered mission. But now researchers are considering an upgrade from solar to nuclear power: "Putting nuclear power on board will extend the mission from 3-6 months [with solar power] to 5 years [with radioisotope power]," says Ed Weiler, head of the Space Science Enterprise at NASA headquarters. "It will enable the rover to drive to a location rather than having to land there. The bandwidth for data communication goes way up, and the rover can work 24 hours a day. Everything increases by a factor of 10 when you add an RTG to a mission." 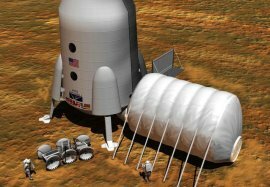 Scaling up from the Mars Lander to a human mission on Mars requires more power--about 30 kW to heat and cool a human habitat, run computers and lights, make oxygen, recycle water and recharge the rovers, says Jeff George. For a long mission "we don't have the kind of energetics where you can dash back home [in case of trouble]," adds Gary Martin, assistant associate administrator for Advanced Systems in NASA's Office of Space Flight. "You're building things that have to be ultra reliable, self-healing, and autonomously sense when they're hurt." Broken parts will have to be made or repaired on site: you can't bring spare parts. Power-intensive processes like making parts or producing propellant for leaving Mars would be another 60 kW, according to George. Left: It's not the Las Vegas strip, but the first Mars Colony will need plenty of power anyway. Image credit: Frassanito & Associates, Inc. In the end, one power source does not fit all needs. Looking at the big picture, John Mankins says "we need very high-efficiency, high-power electric propulsion for interplanetary travel; we need reliable and affordable high-energy chemical propulsion systems for going up and down from planetary surfaces; and we need to be able to store chemical or solar power in order to live and work on the surface. Robots could use radioisotope power; and there's reactor power and wireless beaming to consider as well." The choices are many, yet one thing is clear: Wherever we go in space and whatever we do there, we'll need more power. Fission, Fusion, Antimatter and Flying Saucers -- (RPI) This website compares fission, fusion, and antimatter as potential propulsion technologies for NASA with pictures of conceptual vehicles for each. The Edge of Sunshine -- (Science@NASA) Solar energy is an abundant source of power for spacecraft navigating the inner solar system. But how far away from our star can photovoltaics work? The Grand Tour: See a wonderful 15-minute video about the Voyager mission. Nuclear power in space -- a thorough discussion from the University of Missouri. Pictures include Eisenhower with the prototype RTG, an RTG being replaced by an astronaut on the Moon, and the trajectory of the Ulysses spacecraft. The Continuing Adventures of Deep Space 1 -- (Science@NASA) NASA's experimental Deep Space 1 probe braves its greatest adventure yet--a daring plunge into a comet. Antimatter space propulsion -- an introduction from the matter-antimatter research group at Penn State University. See also "What's the Matter with Antimatter?" from Science@NASA. The Mars Smart Lander will use RTGs for power on the red planet. A presentation on the benefits of nuclear power for going into space.